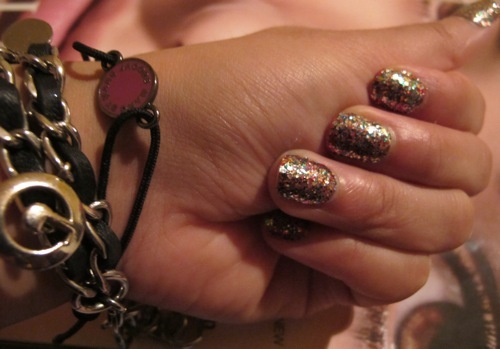 In my last post, Jennifer had asked me about what nail polish I was wearing. Would you believe it’s not your normal nail polish (and there was zero dry time?). Since I’ve tried Minx nails, which I wasn’t totally impressed with, I was put on to Sally Hansen’s Salon Effects Real Nail Strips by LDiva herself from Divalicious. I’ve had a box sitting on my dresser, begging to be put to use and I finally came around. These are not regular old stickers — the peel on’s are actually made from real nail polish so it looks like it too (but much more neater and easier to apply). They come sealed, so all you do is peel the stick side off, press against your nail and file away the excess. Voila, instant salon-looking nails (did I mention there’s no dry time? I’ll say it again). They’re supposed to last up to 10 days, and judging from how they’re wearing so far, I wouldn’t be surprised! This one is called “Frock Star.” They come in 23 varieties, and I think I got my eyes on the gold “Glitz Blitz” next! 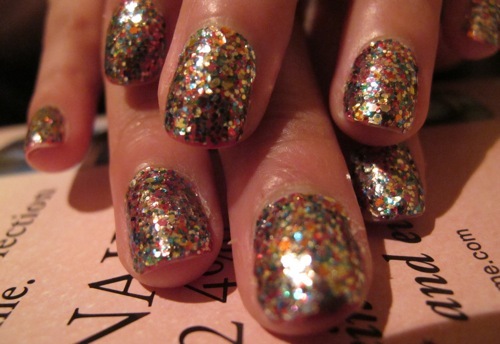 They cost $9 (way less than getting Minx’d), and available at mass retailers and drugstore.com. Anyone else try these? What do you think? i’ve tried them and i loveeee them because i am nail-polishingly challenged. they’re the cheapest at wal-mart ($8.50)- the flower ones are really fun – thats the one i tried! 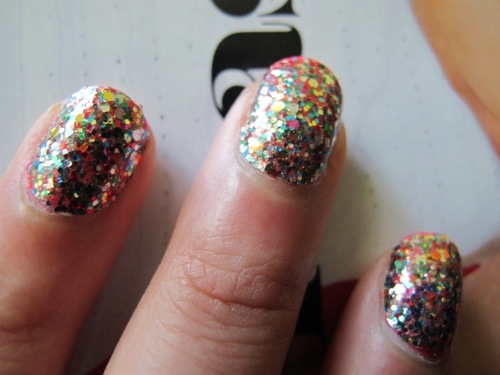 let me know how removing this sparkly one is – i’m wary of the sparkles because in reg. nailpolish it’s like applying cement on your fingers!!! Removing these can be really difficult, when I tried them I removed them after a week by just peeling them off. G’luck! A helpful tip for removing the strips, since unlike regular nail polish they really really adhere to your nails – try the remover that you dip your fingers into (you can even dip more than one at a time) to really rub off and dissolve the strips. I tried the gold glitter ones and loved the look. No mess, no stray sparkles, no time but it was a pain to get off. Wish I had known the dip remover tip. I would still get them again, though — so cute! Oh awesome! Thanks for answering. 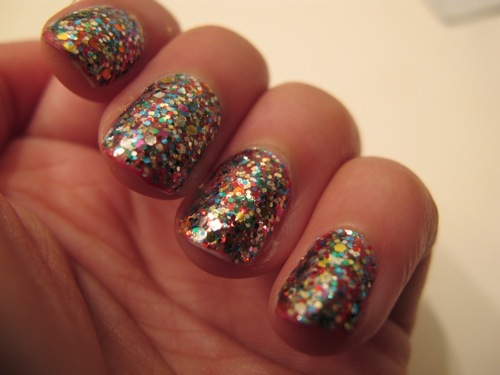 I have used the nail polish strips from Sally Hansen before- it was the Laced Up strips, which were fabulous. I’ll be on the look out for this particular style! Go to Sally’s beauty sppuly or your local sppuly store and purchase acrylic remover. You can also purchase pure acetone. Be sure to use a glass bowl. Soak 4 fingers at a time. Get an orangewood stick to so you can scrap the acrylic when it gets gummy. It will be messy but it won’t take to long. Once you get down to your own nail, take a white buffing block and gently buff off the remaining residue. Apply a clear nail hardener. I’ve tried the soaking with the cotton balls but its takes longer and I don’t like the idea of it being wrapped under foil. The acetone needs to breath because the vapors can be toxic if there isn’t enough ventilation.